Wow, I reached 300 Rolodex Cards A Day! You might know this would be the one I messed up the video with a blurry recordings. I didn't know until it was too late to re-do and I said at the beginning of this adventure, "no re-do." Learn from your mistakes. So if you watch the video you will see what I am talking about. I think 300 cards calls for a give away! The give away starts today and will close Tuesday, November 10th at noon. Here is what I would like you to do. 1. Be a member of my blog and a follower of my You Tube Channel. 2. Leave a comment stating that you want to be in the give away. 3. For an extra entry share my give away on your Blog and/or You Tube Channel. Please let me know if you do spread the word. Your name will go in the pot an extra time or two. 4. If you go to my You Tube channel you will get another entry. Here is the bad video but if you watched until the end you will see some of the mix medium goodies you could win. I will be adding more over the next two weeks so stay tuned. I am so sorry about the quality of this video. Thank you so much for your support and encouragement during the past 300 days. Really enjoy your vids. Put the link on my blog. This card is a testament to your creativity!! Congrats 300! Please add my name into your drawing. You have inspired me to see art in everything. Love your work! Congratulations to you! I am so proud of you for making it this far and all the fun ideas and great products and techniques you have used. 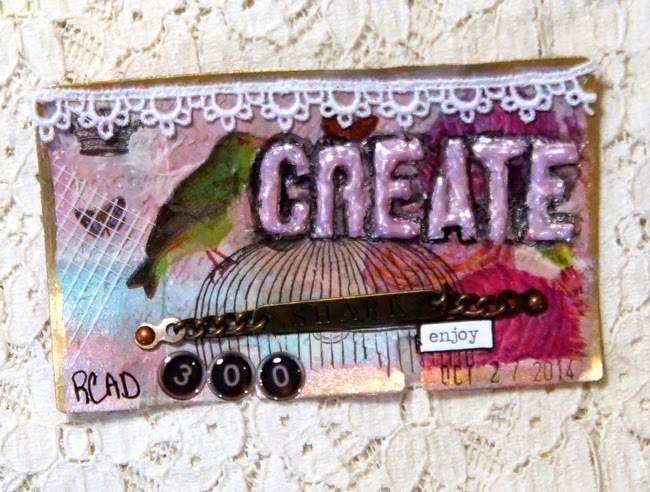 It was fun to see your bag of goodies and that will be a great giveaway for a altered art person to have to work from. Have a great week sweetie. I did a vid shout out for you, not only because of the give away, but just because you deserve it. And ill make a rcad as well this week, just for the fun of it! Awesome job on 300!! TFS Found you on Youtube! Many thanks to CreaBoetiek for telling me about your YouTube channel! Please enter me in your giveaway. Thanks!